My under eye concealer has been getting low and I wanted to try something new. After seeing good reviews of some of the Makeup Revolution concealers I got one of them and this Obsession Concealing Wand in Light was on their website too. There’s a fair amount of product in this with 4.5ml and it costs £6 but I can see it lasting a long time as you don’t need much for this to give decent coverage. It’s a wand with a sponge tip and a twist up end that pushes the product through so no need for any extra brushes. It’s available in various colour correcting and concealer colours and this light concealer is for light neutral skin tones. It’s also both cruelty free and suitable for vegans. It’s the second to last day of the Marks and Spencer’s advent calendar, though I know a lot of advent calendars end today and they always did when I was growing up. When does advent actually end? I always thought the 24th but so many include the 25th now too. Anyway, today’s gift is the Pur Illuminate and Glow Primer, the second primer in three days so I kind of wish they’d spread the two out a bit more. It’s a corrective primer that has some shimmer in it to give a glowy look for a base. The full sized tube is 30ml and £24 so this 10ml tube contains £8 of product. It has a bit of a peachy bronze look to me and definitely has shimmer in so I’m not sure how much I’ll use it as primer. The second thing from an advent calendar, well kind of, is the Forest Walk Wax Tart from the Scented Seasons Shop Twelve Scents of Christmas set I bought and have been picking them out at random as a kind of home done advent calendar. The set was £15 for twelve wax tarts or they can be bought individually for £1.25 each where you pick your scents. I can’t believe it’s Christmas Eve already! We have some things we do on Christmas Eve every year, they’ve become traditions as well as some of them being practical. Things like getting food bits ready or watching certain movies, I love these things that become traditions and are different for each family and don’t necessarily have anything too Christmassy about them. I’m never sure whether to class makeup primers as makeup or skin care, it’s sort of the step between the two, but it seems like this primer is also a moisturiser which is great if you have dry skin. The Autograph Hydrating Confidence Boost Primer is today’s gift from the Marks and Spencer’s beauty advent calendar so now you pretty much have the whole routine for pre makeup prep in mini sizes from this calendar. The full sized 30ml tube is £12.50 meaning this 15ml mini one is worth £6.75, so sort of mid range when it comes to price, and it’s cruelty free and vegan and vegetarian friendly. It’s been a bit of a long project, or rather it’s been an on and off project, since I got the drawers for in my wardrobe to store my beauty things but it’s finally finished and I have my makeup drawer all organised. I’ve been thinking of doing a bit of a post on what I have and how I store it but not sure if anyone would be interested. It’s definitely not a big collection, it all fits in the one drawer, after my various destashing sessions throughout the year and probably half of it is eyeshadow palettes so not a huge variety in there either. Would anyone be interested in that? I don’t think we’ve had any hair products yet this year in the Marks and Spencer’s beauty advent calendar, there’s normally a couple so this’ll be the first. It’s the Percy and Reed Reassuringly Firm Session Hold Hairspray which seems to be a fine mist, slightly less extreme hair spray that has a gentle hold and doesn’t have that look of a hair spray when it’s in your hair. A full sized can is £12 for 100ml so this 50ml travel sized spray is worth £6 and is a great size for in your handbag. I will admit I don’t use much hairspray but it’ll be interesting to try. Also, this is vegan and vegetarian friendly. The wax tart from the Scented Seasons Shop on Etsy is the Christmas Cookie scent. This is a staple for most companies around Christmas and not one of my favourite scents, or a huge fan of overly sweet or bakery scents, but it’s often a good scent to mix in with some sharp so sweeten it up a bit and change the scent. This is part of the Twelve Scents of Christmas set which costs £15 but is also available individually for £1.25 if you want to pick individual scents. The first day of December so the first day of advent. I do love advent calendars, we’ve had them since we were little with chocolate ones, and this year my main advent calendar is the Marks and Spencer’s one. I say main as I do have a Thornton’s chocolate one and a couple of twelve days of Christmas ones, I’m probably going to actually do the one on the twelve days though so I’ll have at least one post every day in December, this may be a first for me! Anyway, onto the gift from today’s box, I do love it when advent calendars do these individual boxes, I have used them a few times for wrapping up Christmas presents that are small enough and they are great at disguising oddly shaped presents too. 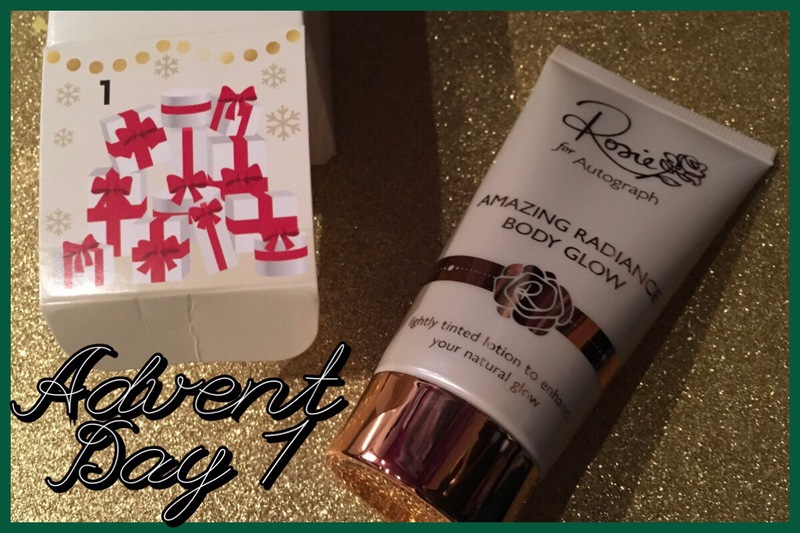 The gift today is from the Rosie for Autograph collection, so it is an exclusive product to Marks and Spencer’s, and it’s the Amazing Radiance Body Glow (50ml tube). It’s not the full sized tube but it’s a good size for travel and it’s a shimmery body lotion that has a golden tint to it.